Where do I get the inspiration to make a animation? How do I start? Creating an animation is difficult. Everyone knows that. 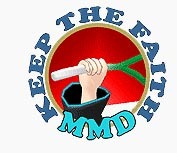 The worst part is when you open up MMD… And you are greeted by that blank, empty screen. Yup, totally inspirational stuff right there! Recently, I created an animation, and it was less than a minute long. It took me about 3 hours to make, with over 1000 frames. Where I got the inspiration? 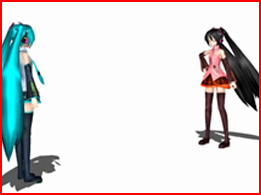 I was looking at some MMD videos on YouTube, and came across one where it was Black Rock Shooter vs Miku Hatsune. I thought that maybe I could create something like that, so I opened up MMD. That was the first time the blank screen didn’t put me down! I set to work. To start with an animation, you need to think about what’s the objective/what is going to happen. 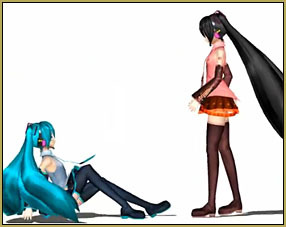 I wanted a fight scene, so I loaded up my Miku Hatsune model and my Miku Zatsune model. I used Miku Zatsune because she looks more like the evil/devilish type. Originally, I set the scene in a dark world with little background. But since my computer was too laggy (I blame Windows Vista) I had to stick with a white background. But that doesn’t mean you have to do the same! Hopefully your computer/laptop doesn’t ‘NOPE’ out of every situation! I wanted it to look like Zatsune was ‘expecting’ Miku, in that ‘I was expecting your arrival’ kind of way. So I made her figure more relaxed and closed her eyes, to give her ‘the look’. 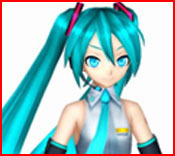 In return, I made Miku look prepared and alert, using her facial expressions. It turned out quite well, in my opinion. Remember, the facial expressions can say a lot about what the person is feeling or what their next action is going to be. The same goes for the poses. After Miku asked Zatsune why she was here, I zoomed in on her eyes to give a tension effect – to tell the watchers that something was going to happen. For Zatsune flying, I used her center bone to lift her into her air, making it look like she was floating. For her walking, I used my walking motion. The fight scene was by far the hardest part – I had to try and give the right atmosphere, the right camera space and make it look like Hatsune could fight Zatsune off. It would have been a bit better if I had timed Hatsune’s movements a bit after Zatsune’s, but I left it. Finally, I managed to finish the animation with Hatsune getting beaten down to the ground, and Zatsune looking down at her in triumph. In the fight scene Hatsune’s expression was scared, showing that she had the lower side in the battle. Zatsune still had the angry expression. Throughout all of this, I still had one problem that I was unable to fix – Zatsune’s hair. The hair kept on getting in the way of the small fight scene, and I coudln’t do anything about it. It would have been nice if the hair had bones, but it didn’t so I had to make do. And that’s it! Yes, I had some difficulties along the way, but in the end I managed to make a successful small MMD video. It turned out just how I wanted it to look like. It didn’t have the same feel as the other MMD video did, but it still had a good atmosphere. So, what are you waiting for? Get creative!